Note this article is basically an English edition of my previous article written in Japanese. This month, Esrille New Keyboard − NISSE with 17.5 mm key spacing (Size M)has been released in addition to the standard 18.8 mm key spacing model (Size L). 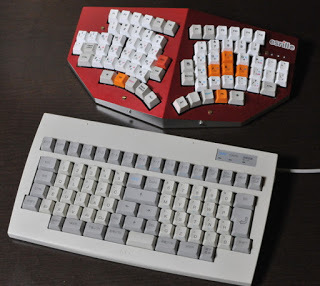 Recently, Japanese ergonomic keyboards evolved since 1980's seem to be revisited very often by keyboard enthusiasts around the world. 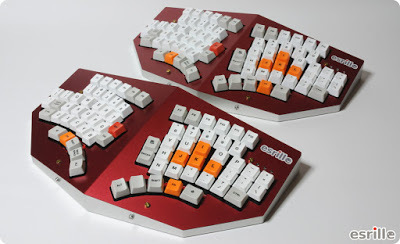 This article describes how Esrille New Keyboard − NISSE has been evolved from the TRON keyboard designed in 1980's in the TRON project. In 1987, Panasonic showed their personal computer prototype running the BTRON operating system. The picture of the prototype can be seen in this article (in Japanese). BTRON operating system had supported multitasking and an overlay multi-window user interface. At that point, Windows 1.0 supported only a tiling-window user interface, and Mac OS had not supported true multitasking yet. The expectation for BTRON to be released was huge in the middle 1980's. 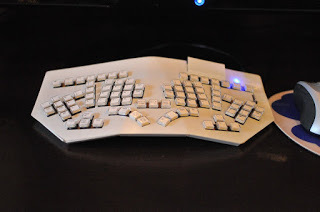 The design of the TRON keyboard attached to the BTRON personal computer was also remarkable. In Japan, people who could touch type were extremely rare in 1980's. The standard keyboards with 19 mm key spacing seemed to be too large for the average Japanese adult hand length to touch type. It was reported that only 15 per cent of college students could touch type even in 2014 in Japan. TRON keyboard addressed these issues; key switches were more naturally placed, and production TRON keyboards were expected to be released in three sizes, S, M, and L without based on the one-size-fits-all mentality. The key spacing used with the M size TRON keyboard was only 16 mm. In 1991, a production TRON keyboard, TK1, was finally released. It could be used with the BTRON personal computers that were also released late in 1991, and with NEC PC-9800 series personal computers that were very popular in Japan until early 1990's. Unfortunately, it was Size M only, and could not be used with Windows running on PC/AT compatibles, which were becoming quite popular even in Japan. The sale of TK1 was ended in 1996. In 2001, about 200 units of a new TRON based keyboard, ST-2000, was manufactured, which was the last TRON keyboard released so far. Note a more conservative version of the TRON keyboard, named µTRON keyboard, is available since 2007. I should also mention about the M-type keyboards that had been sold from NEC since 1983 and for about 20 years. Dr. Masasuke Morita at NEC invented M-type keyboard in the early 1980s. 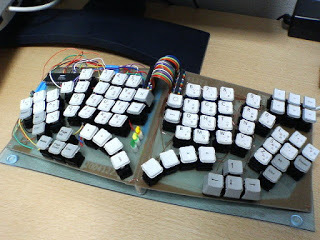 Several pictures of M-type keyboards are collected in this page. 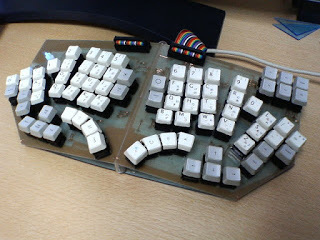 As we can see, Dr. Morita had developed many common designs of today's ergonomic keyboards. 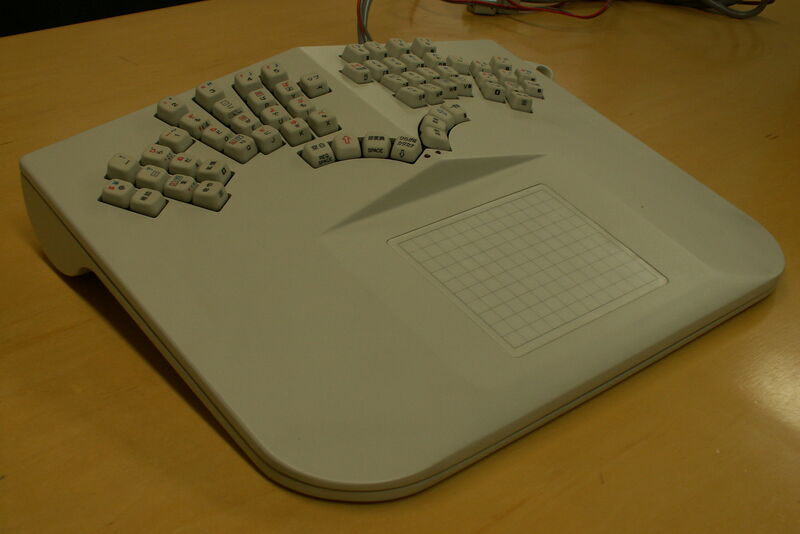 The last M-type keyboard, named ergo-fit keyboard, was released in 1998, and said to be 20,000 units were manufactured a year. The 1st one was basically a failure; PCB patterns had mistakes, and key switches are placed too high from the table. I had to use separate arm rests for using the 1st one. The 2nd one fixed the PCB patterns, and key switches were placed at lower positions by cutting the front corner edges of the PCB outlines. I don't have to use separate arm rests anymore. NISSE uses basically the same PCB outline design used in this 2nd one. The 1st and 2nd one used ALPS switches, which were slightly bigger to be used for a TRON Size M keyboard. The key spacing of the first two units was about 17.5 mm, which turned out to be too large for my hands with the TRON keyboard's switch layout. The 3rd one uses Cherry MX switches, which have a smaller form factor, with the standard 16 mm key spacing of the TRON Size M keyboard. I used the 3rd one for about five years, and it still works fine. The long operating life of Cherry MX switches is quite amazing. The only issue I found with the 3rd one was the placement of key switches for pinkies. The pinky column angle didn't fit with my natural pinky movement, and was not very comfortable to touch type. I made the 4th one with 15 mm key spacing in 2010. I found this small keyboard comfortable with my hands. However, it used tiny tact switches, and I had to make a new one in 2013 as their operation life is not very long like Cherry MX switches. 3. to minimize the construction time by using the standard 18.8 mm key spacing. I have also tweaked the NISSE firmware so that it can handle several efficient Japanese Kana character layouts natively. NISSE supposed to be only my own 5th custom keyboard. However, because of this firmware, several Kana layout users contacted me if they can also use NISSE. It was the beginning of NISSE as a real product. Note : Today, most Japanese people input Japanese characters using Romaji, basically typing one or two English characters that represent the sound of a Japanese Kana character for each Kana character. It is okay but maybe not optimal. Kids do not learn how to write Japanese in Romaji until the third-grade in elementary schools. From late 1970's, several efficient Kana layouts have been studied including the TRON Kana layout. 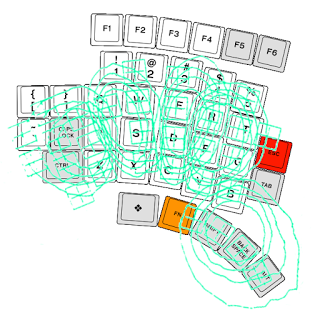 Thumb shift layout, developed by Yasunori Kanda and others at Fujitsu, was the most commercially successful one among those; it even took the word processor market lead in 1980's. Unfortunately, most of the today's operating systems and IMEs do not support those efficient Kana layouts natively. When these Kana layouts are used with NISSE, the firmware of NISSE converts Japanese Kana characters into Romaji internally so that virtually any operating system and IME can be used with these Kana layouts. NISSE Size L was basically designed to fit with the average hand length of Japanese adult male, about 183 mm, or longer. The average hand length of Japanese adult female is about 169 mm. So shrinking the key spacing to about 92 per cent would provide better usability for wider potential users in Japan. NISSE Size M uses 17.5 mm key spacing. While the key spacing of NISSE Size M is 1.5 mm longer than that of TRON Size M keyboard, the required finger reaches are very close as illustrated in the above figure. Note NISSE Size M key layout is not a micro-copy of NISSE Size L; key column angles are also tweaked a bit. The challenge for releasing NISSE Size M is in the production of small keycaps that fit 17.5 mm key spacing. Since the number of NISSE Size M to be released is very limited, making new metal molds for keycaps was not a viable option. Instead keycaps used in NISSE Size M are machined milled by CNC milling machines from the standard 18 mm keycaps for 18.8 mm key spacing. Perhaps it was sort of a lucky for Japanese computer manufactures and researchers that most Japanese people had no experience using keyboards including typewriters until 1980s. Re-inventing a computer keyboard seemed to be considered a right direction, rather than training people to use the existing computer keyboards evolved from typewriters. Even though the commercial results of both TRON keyboard and M-type keyboard didn't look very successful, the researches conducted during 1980's seem to be still valid and actually very interesting. Releasing keyboards in three sizes was one of the goals shown in the TRON project in 1980's. 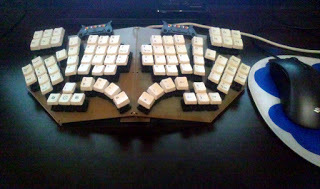 Probably it is more crucial for ergonomic keyboards than the standard keyboards since more users lean their forearms on the table or arm rests during typing and finger reaches are more limited. Now NISSE is provided in two different sizes. Hopefully keycap makers would follow this direction too so that more keyboard makers can release their keyboards in multiple sizes much easily.